The genetic tests allow to verify the inheritance of certain pathologies. The pathologies for which the responsible gene has been identified. The puppies children of tested parents will not suffer from such pathologies. With selection and recently recovery of the breed have been fixed some pathologies in the Lagotto Romagnolo breed too. By examining the DNA of parents it is possible to understand the impact on the litter of the most common pathologies of each breed. The DNA test is carried out with a blood sample. The result of the DNA examination can give three possible outcomes for each individual pathology. Free both alleles of the gene responsible for the disease are healthy. Healthy homozygous Gene. Carrier The two alleles of the gene responsible for the disease are different. heterozygous carrier Gene. Affect both alleles of the gene responsible for the disease are recessive. homozygous recessive Gene. A dog carrier a certain pathology is a healthy dog for that pathology. In other words, He will have no symptoms or manifestations. If he coupled with a Lagotto Romagnolo carrier too, the problem come out tangible on his offspring. For those who couple Lagotto Romagnolo not tested the unknown is just that. The two carrier dogs candidates for coupling do not manifest the pathology, they are healthy, unfortunly in their litter the pathology will be present. Some puppies will result AFFECTED. We can know if a dog is carrier or free only through genetic testing. Why do we performe genetic tests? Genetics makes available a tool to proceed with safety in the direction of the health of the puppies. We have important certainty about the health of our puppies. The Lagotto Romagnolo has a natural dowry as hunting-truffle, that submit the Lagotto Romagnolo breed to litters with little or even without criterion . 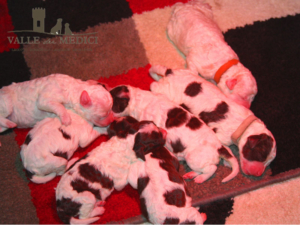 They are mainly private or some animated by interest or alleged love of their Lagotto Romagnolo who decide to start to breed litters no criteria. The information that gives genetic tests are not anoptional but a health guarantee for puppies. 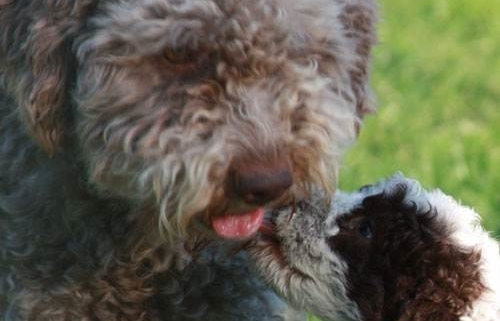 The breed pathologies and the genetic tests of the Lagotto Romagnolo are not a bogeyman. Just going to the breeding sites to see how many healthy dogs are carrier of one or another pathology. I suppose the same incidence is even in dogs not tested who have litters without this information. The real question is that genetic tests are decisive to decide the coupling of reproducers. At the end we can be sure about the health of the puppies in relationship to each genetic pathology of the breed. Genetic tests fot the hereditary pathologies of the Lagotto Romagnolo. JE Juvenile epilepsy: it manifests itself during the life of the dog with episodes ranging from agitation to paralysis. LSD Lagotto Storage disease: The disease begins between 4 months and 4 years. The movement is completely uncoordinated. The disease also affects the character. 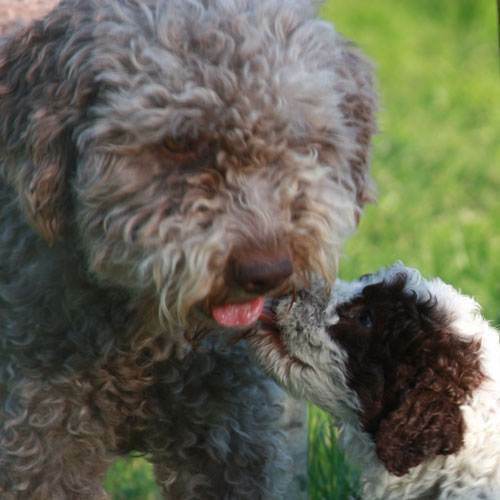 Lagotto develops progressive aggression and statistics said that the carriers are 11% of Lagotto. Furnishing: The pathology is presented with a mutation of the coat. It has no character or health repercussions. A Lagotto Romagnolo affected by Furnishing is not in the Standard of Lagotto Romagnolo and can not participate in show. The cost of genetic testis and selection influence the price of the puppy. 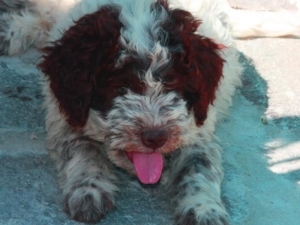 Often those who decide to adopt a puppy of Lagotto Romagnolo do not know these aspects. Especially if you are looking for the first pet dog. Once given the informations present in this article, everyone appreciates to have a puppy of Lagotto Romagnolo son of parents with genetic tests.